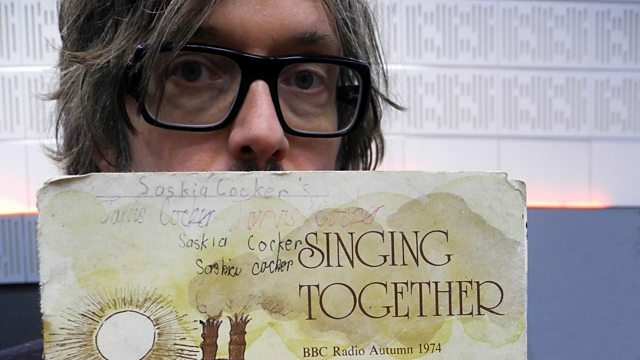 Jarvis Cocker traces the history of the BBC Schools radio programme that taught generations of children to sing. From 2014. Jarvis Cocker sets out on a musical journey to trace the history of Singing Together, the long-running BBC Schools radio programme which got generations of children singing. He uncovers the stories of those who made the programme, listened as children, and used it in their classrooms. Together they remember Monday mornings at 11am, when pupils up and down the country opened their song books and gathered round as teachers wheeled out their classroom radios. Jarvis explores the power of singing to bringing people together. He also uncovers the origins of the folk songs used in the programme and traces how it changed though the 1960s and 70's, opening up to musical traditions from around the world. He reflects on the impact of the long running series - which gave many their first introduction to folk heritage- with award winning musician Eliza Carthy. And he asks why recordings of this hugely popular series were not preserved for posterity. Only a handful of episodes survive in the BBC archive but, with the help of a small community of collectors, he sets out to find some of the missing episodes. Developing music skills for pupils aged 7 - 9. British Council Film Lessons from the Air. Script by Harold Purcell, produced at Merton Park Studios..
1957 British Hit Parade: Britain's Greatest Hits Volume 6 CD4. Singing Together Request Programme, Autumn 1974. School of Scottish Studies Archive. Words and music by Harry Belafonte and Lord Burgess. From "Folk Songs of Jamaica" edited and arranged by Tom Murray  Reprinted O.U.P..
Click here to join in the singalong at the end of the programme.